What's Cooking in your World? Cooking my way Around the World's 193 Countries one Meal at a Time: First Stop Afghanistan - Last Stop Zimbabwe.......And Beyond!! Today is the fist day in several weeks that I've had time enough to make a dish representing the second to last country in my world cooking journey. I decided to get up early to catch the morning light, as it lends such a beautiful patina to photographs. I'm pretty sure my neighbors think know I'm officially nuts. And, if you could have seen me hauling pineapple, peppers, lemons and oranges outside at 6 a.m., then tripping over my tripod on the way out the back door (in my pink dragonfly p.j. 's), you'd nod vigorously in agreement. I used to be quite sane but that was BT ( before teenagers). Don't be too judgy, though. If you woke up to Eminem's nasal tirade streaming out from under your kid's door every morning, you'd be loco too. But I digress. 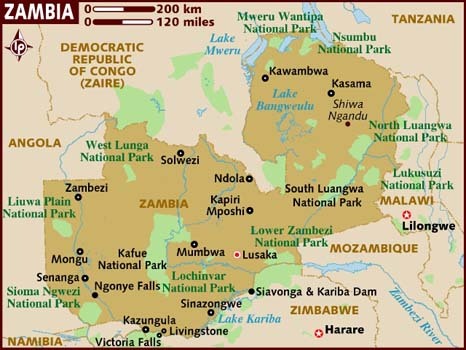 A landlocked country in Southern Africa, Zambia is roughly the size of Texas or France and is known as one of the more peaceful, highly urbanized countries in Africa. Bordered by the Democratic Republic of the Congo, Tanzania, Malawi, Mozambique, Zimbabwe, Botswana, Namibia and Angola, Zambia is home to 72 ethnic groups. Originally, the country was inhabited by Khoisan people, but was colonized during the 13 century by the Bantu. European explorers discovered the country during the 18 century. 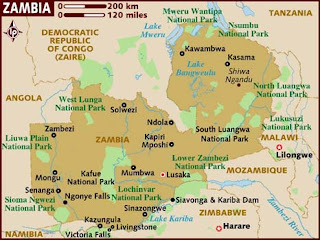 In the 19 century, the country became a British colony of Northern Rhodesia, but by 1964, Zambia declared independence from the UK. In recent years, the country has undergone a strong period of economic reform, but the economic infrastructure of the country remains largely that of subsistence farming. Owing to vast natural resources and rich mineral and copper mining, the country has promising potential to someday compete in the global market. Zimbabwe's climate is tropical to sub-tropical. Peanuts, cassava, chilli peppers, beans and corn are all grown here. The staple diet is corn-based in the form of Nshima. Maize or cassava flour are ground and mixed to a thick porridge that is eaten alone or alongside condiments with meats, fish, sour milk or beans. In fact, Nshima is such a huge and important part of the culture, that songs, poems, stories, rituals and folk lore have regularly referenced this dish that nourishes and sustains the country's people. Add all the ingredients to a large saucepan and simmer gently for 30 minutes (if the mixture seems too thick add up to 1 cup of pineapple juice). When ready allow to cool a little then pack into hot, sterile, jars. Never been a great fan of chutney but yours look delicious. The colour is amazing! Guess I blame the many ploughman's lunches I've had with the dry cheese and brownish chutney (with raisins)! Yuk! Riverbank & Badger » Week 27. Panama. Ceviche. Week 86. Kenya. Nyama Choma. What's Cooking in your World 2010-2012. Simple theme. Powered by Blogger.